Way way back in the 1980's a movie like The Way Way Back might have been a simple but still delightful coming of age romp in the John Hughes mold about young love, teenage awkwardness, and growing up white and middle class. Unfortunately, we now live in a time when that kind of movie doesn't really satisfy anymore, as complexity and over-analysis rule the day. Now the perpetually shy kid has to wind up somewhere on the Autism spectrum, the cool amateur philosopher mentor has crippling arrested development, and the bad guy, instead of getting his comeuppance perhaps via a haphazardly placed pastry sent reeling into his face, now just sort of lives with the fact that some people know he's a jerk. Still, for all its needless complications getting in the way of nostalgia, The Way Way Back is probably the most earnest example of its genre that you're likely to see anytime soon, and gets it mostly right from beginning to end. 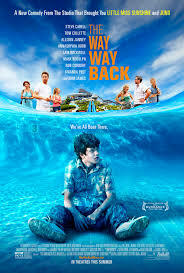 The Way Way Back follows an antisocial teen on what starts out as the worst vacation of his life, travelling with his mom, her new boyfriend, and his new bratty stepsister, until he happens upon an unlikely group of friends and a new source of self-confidence at the local water park. The Way Way Back is the definition of a crowd pleaser, light, breezy, and heartwarming almost to the point of pandering, but not so far that you can come down too harshly on it. 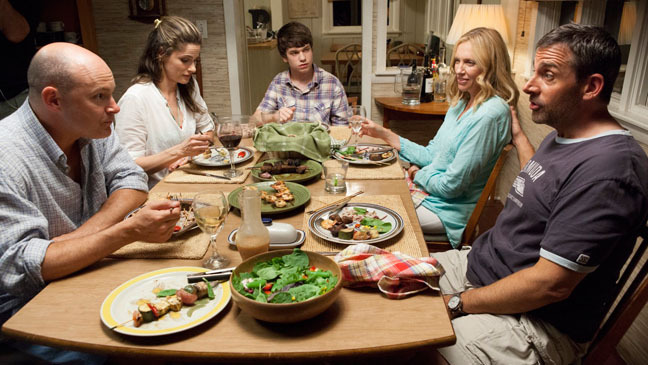 Its heavier moments feel a bit out of place amid the unabashed joy the movie revels in, but these are few and far between, and for the most part, the film is the cinematic equivalent of comfort food. It doesn't try to re-invent the wheel, and you pretty much know how its all going to turn out by the first ten minutes, but its just so damn charming and instantly appealing that it doesn't matter. The cast is pitch perfect from top to bottom, led by Sam Rockwell in yet another performance that begs the question of why this guy is still struggling for more mainstream appeal. He easily carries the movie, but that isn't to take away from the rest of the actors who all bring something special to the table. Though forced by the story to be just a bit more odd than I'd like, tactless and hyper literal, Liam James pulls off the evolution of our teenage hero from shy introvert to confidant young adult very well and the always engaging Toni Collette is able to express a subtle vulnerability with her character despite the film viewing the adults mostly through the eyes of their children, as flighty irresponsible chumps. Steve Carell plays the king of the chumps, who continues to find new ways to make unapologetic assholes more sympathetic than you thought they could be. Writer/directors Jim Rash and Nat Faxon show up in comedy relief roles that really make me want to see them in their own self-written buddy sitcom together, and also Amanda Peet's there for some reason. You know, if you're into that. If I had one major criticism for this movie, its that it attempts to apply a level of realism to a set of circumstances that, at least for me, are probably better left a little more goofy and lighthearted. When the main character's mom discovers her new boyfriend is cheating on her, she doesn't conveniently find a better, hunkier guy who runs the surf shop down the street, but instead realizes that at the moment, she has very few options but to stay with this jerk. And when this spirals out into a reason to end the trip, our hero must face the fact that the best summer of his life is prematurely over. Now, maybe you would find this to be a welcome twist on the formula, but I don't go to see movies like this wanting to be reminded of reality. I want to forget all that and pretend just for a few hours that maybe the fun times can last forever, and don't have to end just because Steve Carell's a douche. And because it spends so much time trying to reality up my fantasy wish fulfillment, it misses some of the beats I was hoping for. Now, again, you might commend the film on avoiding cliches, but goddammit, those were my cliches and I want 'em back! For instance, every coming of age movie tends to have that one thing that's referenced earlier in the film, only to come back at the end as a big uplifting moment cementing the fact that our main character has become a man, or overcome his fears, or surpassed whatever his conflict was. The example I have off the top of my head for no reason in particular is Heavyweights, when a sad little fat kid's off hand dream of flying is later granted by a go-cart and a well placed hill. That moment in this movie is, well, kind of lame to be honest, when it should be the final cathartic send off. But that's a relatively small problem for what is on the whole a wonderful movie designed to appeal to pretty much everyone. As enamored as it is with the 80's school of coming of age cinema, its not self aware enough to qualify as a deconstruction of the genre or anything close to a Wet Hot American Summer style satire, and despite its slightly more modern approach, it ultimately finds a happy medium between nostalgic throwback and charming indie movie. At the end of the day, I'd say that if my biggest problem is that I wanted it to be more cliche and predictable than it was, I think that's a good place to be. The Way Way Back is one of a very small handful of movies in a very long and disappointing year that I would emphatically recommend seeing no matter what your overall tastes might be. No matter who you are, chances are there's at least something in here to enjoy.